An error establishing a database connection in WordPress is a worst nightmare for all WordPress beginners. It is one of the most common WordPress error that can occur due to a several different causes. In this article, we have attempted to cover all possible solutions to fix it. What is this error and why it occurs in WordPress? This is the most common error and does not specifically related to WordPress. You receive this error because your WordPress script is unable to establish connection with the database. We will discuss all causes and recommended solutions to fix this issue. First, we will determine why WordPress is unable to establish a database connection. The most common reason behind this error is incorrect database credentials. It is possible that database login credentials are incorrect or have been changed recently. You will find these database login credentials at wp-config.php file under WordPress installation directory. How do I test my existing database login credentials? Replace your database username and password and save it. Now, browse this file like: http://website.com/connection.php. You would see either a successful connection message, or an error message. If any of above database connection tests fail, it indicates that you have incorrect database login credentials at wp-cofing.php. In most cases, DB_HOST value would be localhost but it is not necessary. It may vary depending on your web hosting provider. You can always contact your web hosting provider for the exact DB_HOST value. To fix this, you can reset the database password with the password you found in the wp-config.php file from cPanel. Refer our knowledgebase article on how to reset the MySQL database password. 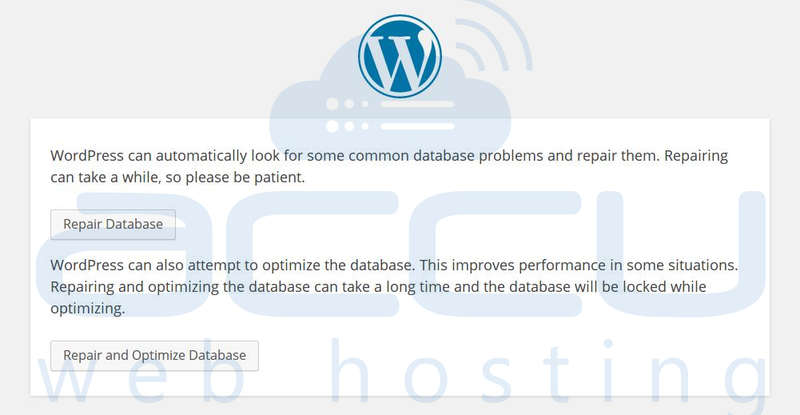 If your website showing Error establishing a database connection in WordPress website but WordPress dashboard (wp-admin) throws some different error like One or more database tables are unavailable, then you should consider database repairing. Once you add this line to wp-config.php file, navigate to www.website.com/wp-admin/maint/repair.php (Do not forget to replace “website.com” with your actual URL). You would see above screen with two options to repair, Repair Database or Repair and Optimize Database. You can choose either one of these options. Please note that Repair and Optimize Database option will take longer. Once you have repaired and optimized your database, make sure you remove this line from your wp-config.php because database repair page is not secure and to access this functionality, admin user does not need to be logged in. If you do not remove this line, anyone can access this functionality through this URL. This error can also occur when your website is bumped with lots of traffic or your WordPress webite is having too many concurrent connections. If you are on shared hosting plans, your Web Host might have restricted the number of MySQL connections or their MySQL server is too busy/unresponsive. If you are on shared Host, you can contact your Web Hosting provider and ask them if their MySQL server is responsive. If you own VPS or Dedicated server, connect to your server through SSH and fire following commands to check status of MySQL server. How to upgrade WordPress Plugins? How to enable Redis Object Cache on your free WordPress hosting? How to make a WordPress Website Search Engine Friendly? How to Leverage Browser Caching of WordPress Website via .htaccess?